TO BLAST OR NOT TO BLAST? HOW IMPORTANT IS PLAYING FAST ON THE DRUMSET? Recently I conducted a survey among subscribers to The Modern Beat Official, its function being to determine the kind of new courses I should be creating to meet members’ needs. The results were interesting - almost 45% of the 170 people who completed the survey said that speed was something they wanted to improve. I’m fairly confident I know why this is the case - and it’s not why you’d think, i.e. to be able to show off. It’s because many drummers, particularly those in an intermediate state of ability, perceive speed on the drums as an expressive tool - that is, a way to communicate with the audience on an individual level opposed to something which should primarily support the ensemble. Something we often hear is “Less is More”, but what does that mean? I would argue that speed work is actually of great importance to drummers, but to best understand how it can be applied we first need to unpackage this well-used adage. There exists a notion that drum parts tend to be simple, particularly in genres such as reggae or rock music. As they mature, every drummer goes through an internal uprising of sorts, where he or she tries to challenge this by incorporating unnecessary elements into their parts. It’s not until further along, when a drummer becomes more experienced and develops a more holistic sense of ensemble playing that we begin to understand ‘playing musically’. Every musician of course has a slightly different definition of what it means to play musically—that’s what makes us individual—but in my own experience it can be summed up by using the approach of serving the music. The benefit of serving the music? Simply that you are more effectively communicating with the listener. The music is less indulgent, the listener is more engaged and musical communication, despite transcending speech, is delivered in terms a listener can comprehend. I’m not saying that this always calls for simplicity, what it does call for is that the drummer listens, thinks and reacts to make their role in the ensemble optimal. I personally feel that a drummer unlocks a new level in their playing once they begin to understand how powerful this approach is, he or she can fully understand the benefit of playing more simply, thus shedding some light on the whole ‘less is more’ thing. So why is working on speed important? It comes down to two clear benefits; being a more versatile player and improving your technique. Drums are actually pretty unique in that in order to play them faster, you actually have to be more relaxed - this is actually what bugged most drummers I know about the 2014 film ‘Whiplash’. While most of us are able to clearly see the narrative for what it is—a thrilling film about someone giving their all to be the best they can be—there are some discrepancies in the footage of him playing which would be fine if not for the fact that they're particularly misleading! Theoretically, when playing fast swing patterns your movements become smaller, you use more focused stick control and finger technique and the skip note tends to straighten rather than swing. Combining these things means that, while technically difficult, it’s far less likely you’ll develop blisters (let alone bleed) as a result! So while I can appreciate the sentiment behind this scene, at the same time I’m sure most drummers are collectively hoping it doesn’t give fledgling players the wrong idea. It’s important to understand how faster playing can function in different genres. I grew up listening to a lot of extreme metal where speed is almost the defining factor, but funnily enough it was jazz players such as Buddy Rich, Eric Harland and Jeff Ballard who made me want to focus more on speed development. Check out this version of Radiohead’s ‘Knives Out’ performed by Brad Meldhau's trio where Ballard uses some pretty phenomenal speed work to provide a wash of intricate rhythms - think about the effect it has against the sparse keys part. It essentially transforms the piece from a ballad into something entirely different; in this instance speed provides kind of simmering intensity which (I feel) makes the track. Now check out this footage of John Longstreth from the metal band Origin performing ‘Wrath of Vishnu’. Longstreth is widely regarded as one of the faster players, but just look at how relaxed he is - it doesn’t even look like he’s out of breath! This level of comfort at this speed only comes for the right kind of practice, which is the reason players like Longstreth, George Kolias and Mark Mirinov can handle not just four minutes of playing like this, but whole sets lasting up to an hour. My point is this; speed is far from the most important thing you can be working on, but as it can be developed only by working on correct technique, a byproduct will be that your playing will become more consistent, you’ll be more relaxed at the kit and you’ll simply be a more versatile player. It should never be a priority in your drum part (remember to serve the music!) but at least be mindful of what it can do for a track, i.e. provide intensity, momentum and help to outline the song structure. However many drummers replied to that survey saying that they wanted to work on speed, an equal number have commented on The Modern Beat speed lesson ads complaining that too much emphasis is given to speed over groove or timekeeping - I also find this particularly interesting. The musical priorities of an individual change over time naturally, it's a nice thought that younger drummers would gain insight based on a random commenter, but I'm afraid it's a process which is shaped by our immediate surroundings and influences, and is therefore different for everyone. 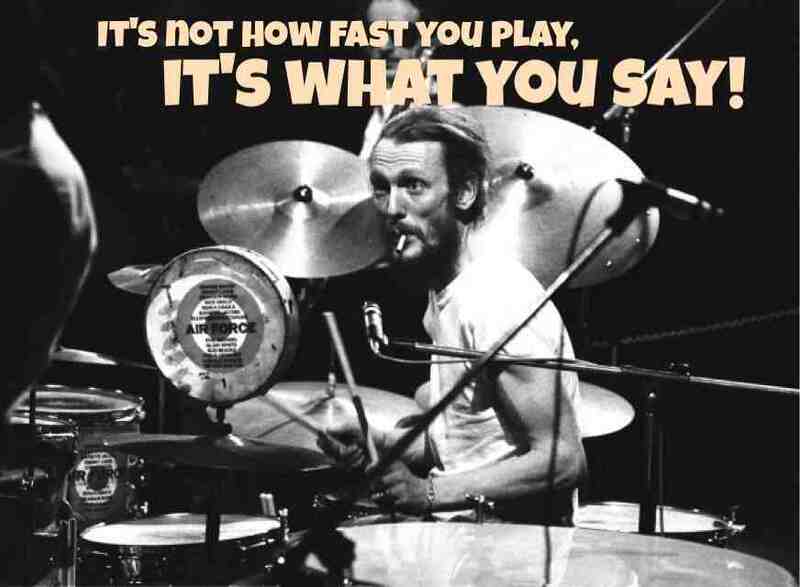 The photo and accompanying quote in the opening paragraph of the post is of Blind Faith's Ginger Baker, and hope it's clear that I am in no way disagreeing with him, nor am I condoning a disproportionate focus on speed within a drummer's overall practice regimen. What I am really saying is that yes, it IS what you say rather than how fast you play, but by omitting speed development from your drumming, you're drastically restricting how you can say it.